Here is yet another list of free games considered awesome by the majority of this blog’s writers (me). As you can see, my taste in games is quite retro. Note: The author of Cave Story has requested people to stop distributing the game, this is because is is to be expected to be available on WiiWare (I hope the game will not be exclusive to Wii gamers). Here’s one such rumor. Here is a game that is on every free games list and for a reason. 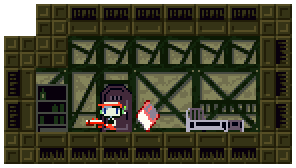 Cave Story feels and looks like a NES game that was updated for a SNES release. The graphics are simple and sometimes blocky – but intentionally so. Similarly, the music is something you would hear in a NES game. In a good NES game. I still find myself humming the catchy tunes even though I finished the game a while ago. The basic game is about making a little guy run, jump and shoot. There are a variety of weapons, some weapon choices even alter the game story. There even is simple leveling up, some enemies drop crystals that make your current weapon more powerful. Best of all, there clearly has been huge effort in making the game more than a retro run-and-gun game. There actually is a good, long story about cute creatures that need your help. The levels are huge and varied: there even is a side-scrolling level. Another level twists the standard game mechanics as you need to negotiate a flooded area with vortices that usually pull you into unsurprisingly lethal spikes. There also are memorable boss fights including one with a boss larger than the screen. Now that I mentioned it, the game is simply memorable. There are too many things to tell about this game. Too bad the game is free because it clearly is worth money. The game is available at least for PC, Mac and GP2X. Transport Tycoon probably is the game that I have spent the most time with, ever. It’s basically about tiny trains hauling things from A to B, then hauling things from B to C.
Sounds boring. Why is it so awesome? Because there is a ton of things to try to make your transport empire make more money. You could build a simple track from place A to B and then another track from C to D. But if you’re smart, you’ll build a whole railway system and connect satellite stations to it – just like it is done in the real world. Then, to make trains smarter, you’ll add signals, build more efficient stations and update your old routes to monorails and so on. I think the defining factor that makes OpenTTD so fun is that it is actually you who builds all these things. For example, in some other simple game you could select between a few station types – each with their own cost and efficiency. In OpenTTD, you have exactly one station type. What makes a station efficient is how you connect the rails to it, how many platforms it has and do slower trains clog up the whole system. To give some perspective, here is the game manual on stations. There also are airplanes, ships and trucks but they’re rubbish. OpenTTD is ported on many systems as it is open source. There even is a Nintendo DS port. Star Control 2 is probably one of the most loved games from the early 1990s. It combines exactly right amounts of adventure, action, exploration and humor. The game is about you, the spaceship captain, trying to free Earth and the known universe from the Ur-Quan (tentacled slavemasters). The gameplay consists of a top-down view of your ship. The ship is controlled by rotating and thrusting – nothing new since Spacewar or Asteroids. The controls remain the same whether the ship was in hyperspace, traveling for hundreds of light years, and during close encounters with enemies, i.e. dogfighting to death while orbiting a planet. When your ship is in hyperspace, you can travel between stars. Every star has planets orbiting it, most of the game features you launching an exploratory ship down on the planets and collecting minerals and biological samples. The things you find act as money: at Earth you can trade minerals and other stuff to fuel, technology, crew and fighters. The biological samples can be traded for new technology when you come across a certain alien race. Some stars are the homeworlds of alien races – some friendly, some less friendly. When meeting an alien, you will converse with them using different bits of dialogue, similarly to most adventure games in general. You will often get information where to find more alien races and sometimes you’ll get a quest to complete. Sometimes, you’ll be able to avoid battles if you are smart when conversing with the aliens. It is during these encounters you will get the most laughs. The presentation is nothing short of awesome. Every race you meet has its own theme music, animated graphics, voice acting and even font for the captions.